Our Lord had spoken to His disciples many times not only concerning His Passion, Cross, and Death, but also concerning the coming persecutions and afflictions that they themselves would endure. Since all these evils were near at hand, but the enjoyment of good things which they hoped to receive in their stead was yet to come, our Savior desired to give them full assurance, evidently and openly, concerning that glory which is prepared for those who endure to the end. Therefore, fulfilling that which He had promised shortly before, that "there be some standing here which shall not taste of death, till they see the Son of man coming in His Kingdom" (Matt. 16:28), He took His three foremost disciples and ascended Mount Tabor, where He was transfigured before them. His face shone like the sun, and His clothes became white as the light. Suddenly, together with this dread and marvelous effulgence of light, there appeared those pinnacles of the Prophets, Moses and Elias, who spoke with the Lord Jesus concerning His saving Passion which was about to take place. Standing before Him as reverent servants, they showed that He is the Lord of both the living and the dead, for Moses came forth from Hades, having died many centuries before, and Elias, as it were from heaven, whither he had been taken up while yet alive. After a little while a radiant cloud overshadowed them and out of the cloud they heard that same voice which had been heard at the Jordan at the Baptism of Christ, testifying to the Divinity of Jesus and saying: "This is My beloved Son, in Whom I am well-pleased; hear ye Him" (Matt. 17: 5). Such are the marvels, truly worthy of God, celebrated in this present feast, which is an image and prefiguring of the future state of the righteous, whose splendor the Lord spoke of, saying: "Then shall the righteous shine forth as the sun" (Matt. 13:43). It is because of this that the Kontakion of this Feast is said daily (when there is not a great feast) in the Service of the Typica in perpetual commemoration of the glory that will be the lot of the Saints. 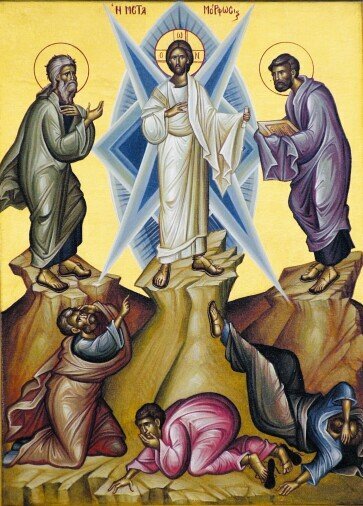 According to tradition, the Lord's Transfiguration came to pass forty days before His Crucifixion; this is why the Transfiguration is celebrated forty days before the Exaltation of the Cross. Share the feast of Transfiguration of our Lord and Savior Jesus Christ with an icon greeting ecard.